In this guide, we’ll be giving advice and tips on how to best prepare for the upcoming holidays: from managing inventory to hiring to marketing on mobile and social media. The holidays are one of the busiest times of year for retailers, and you don’t want to miss out on them. 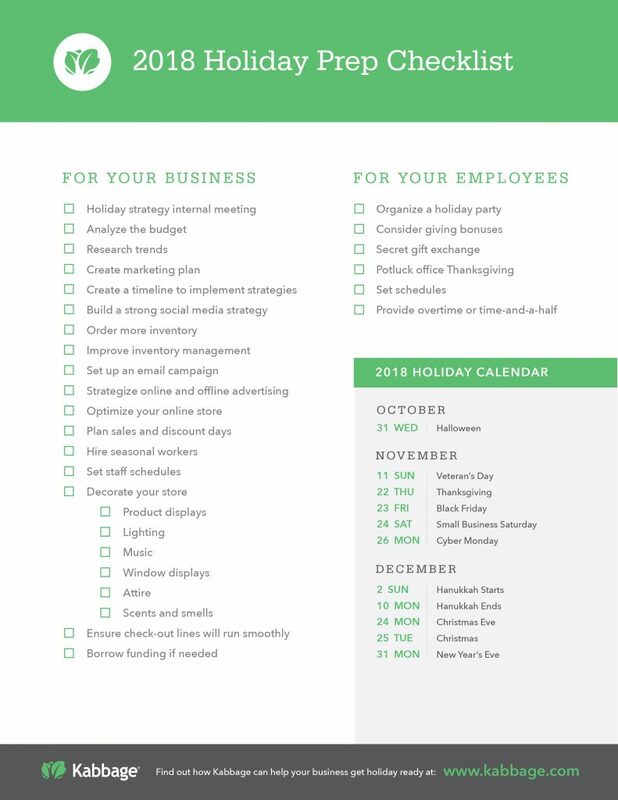 To ensure you’re prepared to take advantage of the potential revenue, keep the checklist below on-hand while you ready for your business for the holidays. With your checklist in hand, it’s time to start mapping out your holiday strategy. You may think it’s too soon, but the close of summer and the beginning of fall is the best time to start preparing. As a business owner, you should put yourself in a position where you are prepared for the holiday season. In order to do that efficiently, review and analyze any hiccups that occurred last year, including what you weren’t prepared for, shipping issues and revamping hours of operation. Here are seven tips for you to get started on planning for the holiday season. The first item on the list is to meet with your staff. It’s important to include their input in this process. Ask them what they noticed last year during the holiday season. What was their experience? What was it that they think worked successfully? What failed miserably? And make sure to discuss holiday schedules if necessary. Additional holiday hours are typically needed to accommodate additional sales and orders, so develop a schedule for additional hours for your staff. Staffing additional man-hours may be out of the norm for your business, so try incentivizing your employees to work overtime. There are different ways that you can go about this. The obvious and popular way is a monetary incentive, but you can try offering additional time off after the holidays or gift incentives. If the end of the year is a time that your business is closed on some days, developing a skeleton crew is a must. This would work by having some staff work on some days and then alternate days or hours. As a business owner, developing a plan to use a skeleton crew is also good to lower the expense of paying for additional hours. But once again, this will depend on the type of business that you operate. During the busy time, you definitely have to stay organized. So, what can you do ahead of time to make sure everything is in order? If you have a brick-and-mortar location, getting organized includes making sure that your location is clean and holiday ready. This should include ordering holiday decorations and cards if you don’t have them already. The holiday season is the time that you should also order any additional supplies that you may need. Research online tools that you can use during the holiday season, which may include online tools to track inventory and shipping as well as social media marketing management systems (think Hootsuite). You can start now by scheduling your social media marketing campaigns and posts. After you have met with your staff and you have determined the amount of personnel you need, start scheduling their hours now. By preparing the schedule now, you won’t have to worry about it later when you’re swamped with clients and orders. As a business owner, you know there will be emergencies or situations that you can’t foresee, so it’s always a good idea to make sure that you’re not short-staffed. Depending on your type of business, it may be a good idea to hire additional seasonal staff members if your budget allows it. Reviewing current strategies is important to counteract any holiday season-related hiccups. Take the feedback that you received from your staff and implement it in your policies. During this busy time, it should be imperative that your customer service is impeccable. This ensures repeat business year-round. Therefore, you should review all of your policies concerning returns and shipping. As it relates to shipping, some businesses participate in Free Shipping Day. This can be a win for you to attract customers. However, it’s important to make sure that the process is a smooth one. If you decide to participate, make sure that your policies are updated to reflect it. Initially, there may be some hiccups, but if you plan for them, they don’t have to become a headache. After you’ve met with your staff and come up with a plan to embrace the holiday season, you should strategize. In order to reap the benefits of the holiday season, develop a holiday marketing plan to increase your profits. Strategizing in the anticipation for this time of the year is a great idea for any business. So, make sure to incorporate creativity! Do something different to attract all of those holiday shoppers or clients who love to spend this time of year. Perhaps include a handwritten note to your existing client base wishing them a Happy Holidays with a small sample of your product. By doing this, you’re showing customers your appreciation while also keeping your business in their mind. With the presence of Black Friday and Cyber Monday comes discounts and sales. It’s a great time to entice your existing customer base with discounted products and services, which is always a good marketing tool! Use this to your advantage by sending targeted incentives (such as coupons and exclusive deals) to a preferred customer list. While promoting the business, it may be a good idea to inform your clients of any pre-holiday promotions. However, don’t go overboard. Remember: You want to make a profit, too! Similar to your regular marketing plan, in anticipation of the holiday influx, you should make sure that SEO and content marketing is implemented wisely. Go back to your previous years’ campaigns and analytics. What worked? What are the trends for this year? When looking at the trends, it’s a good idea to uncover what people are searching for related to your industry and the holidays. So, make sure that your SEO is on track by researching the historical trends for keywords. When it comes to any content, make sure that you are using your content to inform them, but at the same time tie it into the holidays. Reinforce your new content by sending out email campaigns. Just remember that engagement is key, so engage get them excited about the impending holiday. Now would be the perfect time to perform any necessary upgrades to your website. More and more customers are shopping online, so it’s important that your website is running smoothly and able to handle new customers in addition to existing clientele. Your website must be able to accommodate all of the sales that you’re going to receive, so take the time now to work out any bugs or kinks dealing with your website for a smooth user experience. Don’t forget to double check and troubleshoot all payment processing. You don’t want to lose out on any potential revenue because your website was down or because your merchant credit processing was having issues. In addition, update your website with all necessary holiday information including holiday hours and any additional policies including shipping, returns and special pricing. The key to website preparedness is to make sure your website is ready to accommodate the herds of clients who are coming your way. After all those hours of preparing for the holidays, one of the most important tips is to remember the holiday spirit. With all of the work that goes into the preparation and the planning, remember to have a good time and encourage your staff to do so, as well. After you’ve reviewed with your staff and determined how you want to reach customers, reviewing your budget is the next step in your holiday strategy. See what’s feasible and where you may have leeway. Here’s a breakdown of 11 areas of your business that need a budgeting review for the holidays. If you haven’t already, you’ll probably soon be bombarded with plenty of holiday advertising opportunities. Some may be beneficial to consider while others may be not worth the expense. It’s important to carefully consider the return on investment on all new and existing advertising opportunities. The same exercise in looking at return on investment is a must when considering all marketing efforts. These pre-season months can be used wisely to develop a marketing plan that will maximize sales during the holidays. The elements of your marketing plan and budget should be cohesive and well mapped out to minimize any waste or missed opportunities. The holiday season is made for get-togethers. Whether it’s the employee dinner or the customer open house, you’ll want to budget for those special events that you host to celebrate those who support your business. Drill down into costs for venue, catering, decorations, invitations and more. When you look at the cost of events, you may question their return on your investment. However, it’s important to consider the value that events provide in promoting customer and employee satisfaction. This is often worth far more than what you can determine by adding up the numbers. The earlier you jump on budgeting and planning for events, the better. Not only will you secure the venue and vendors you want, you won’t be scrambling once the busy season begins or paying a premium for late in the game orders and reservations. Like events, you probably give tokens of appreciation to employees, contractors and perhaps even vendors. They need to be considered when creating your holiday budget. They’re a cost of doing business like events that may not show direct returns on your investment. However, they are most likely vital to your business’s long-term success. While you don’t have to give lavish gifts to everyone, even something small with a card thanking them and wishing them a happy holiday can show a deep level of appreciation. Make sure they know that this is strictly a gift and that you’re not expecting overtime or discounts for free because of it. It’s merely a token of your appreciation. The additional customers and sales that the holidays bring may warrant the need for more equipment. For brick and mortar retailers, this may mean additional point of sale systems or displays. Online retailers might need improved equipment to pack and ship orders. Do you deliver within your community? Could a car or truck help you get orders in the hands of your customers quicker? Think about every piece of equipment you use in your business and get a jump on any repairs or upgrades. If you’ve been pondering the idea of investing in business equipment, this might be the right time to make the plunge. You’ll have it ready to go when it is peak sales time and be able to take any applicable tax deductions when you file your next tax return. For any business, inventory planning is crucial to achieving success on Black Friday and the days leading up to Christmas. You can’t afford to run out of inventory with two weeks left in the season. However, you also don’t want to find yourself with shelves of unsold products on January 1 either. Inventory management directly affects your revenue, so you want to ensure you’re managing it correctly. 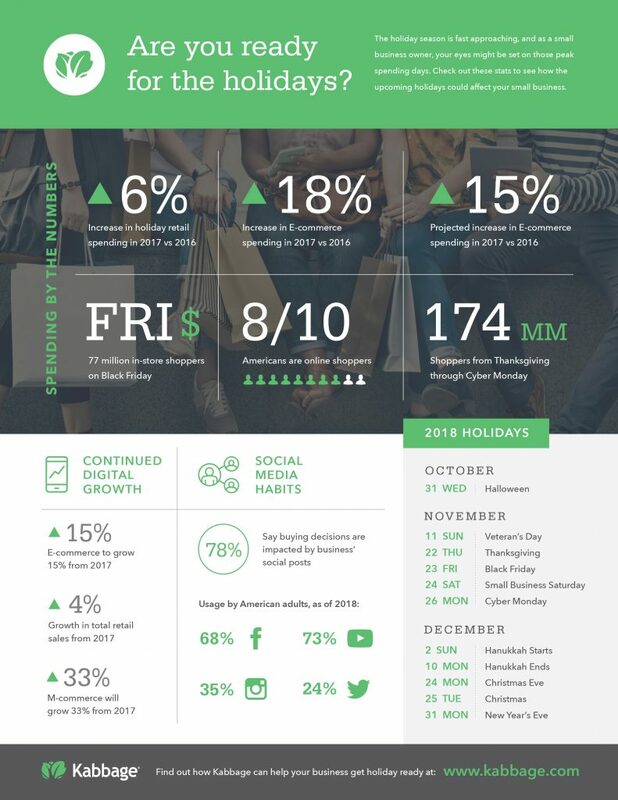 Look closely at your sales numbers from last year. Would you have been better off ordering more or less? Take into account other considerations too such as new products you’re offering, additional advertising efforts that ay generate more traffic to your store, and sales you plan to promote. All of these can have a profound effect on the demand for what you’re selling. If you ran into a shortage of help last holiday season, budget for staff this year. Whether this means hiring a full-time employee who can help you grow next year or just contract help for the season, evaluate wages or salaries as well as any benefits you’re willing to offer. These should be added to your budget. After all, you don’t want to find yourself in middle of the season without the help you need. If demand for your business isn’t as high this winter, consider cutting down some shifts for part-time or hourly workers. You could also brainstorm ideas to help cover the seasonal lull and schedule your staff based on those ideas. Have you been putting off a refresh of your office or store? You still have time to polish your surroundings to have them ready to go for the holidays. Even small investments in paint, shelving, displays, furniture or flooring can make a big impact which could actually lead to more sales. It may not make financial sense to wait until next year when you can leverage the benefits of your investment during the most profitable time of the year. Nearly every retailer offers at least one holiday sale or promotion. Your customers expect incentives this time of year, and if you’re going to increase sales, you’ll probably need to budget this for the season. This doesn’t necessarily mean you have to slash prices in half to make customers happy. There are actually many ways to add value to their purchases. Consider a free promotional item you give them with a sale or a discount coupon that they can use during those traditionally slow months of January and February. Be creative, but don’t forget to incorporate these costs into your budget. More sales naturally will lead to more returns. And returns wind up costing your business money. Research how much returns cost your business last holiday season, and make sure you budget for at least this amount. Very few business expenses are not at least somewhat tax deductible. Everything from holiday parties to the hourly rate you pay the IT guy who backs up your system is deductible. You’ll want to first keep very good track of all holiday expenses and consult with your tax or financial professional about the specifics of what you can and cannot deduct. Oftentimes, you can significantly lower your tax liability with the wide variety of expenses you incur. Once you’ve completed your holiday season budget, you may discover you’ll need additional capital to cover your expenses. A quick, flexible source of financing can be a great choice to help your business as it continues to grow. So how can you prepare your shop for the peak spending holidays? Here, we’ll guide you through Black Friday, Small Business Saturday and Cyber Monday as well as provide some seasonal holiday tips. With your budget down and checklist in hand, it’s time to start creating an action plan for each holiday. Here, we’ll guide you through Black Friday, Small Business Saturday and Cyber Monday as well as provide some general seasonal holiday tips. Black Friday is one prime holiday for your retail business. The NRF reported that more than 174 million consumers shopped in stores and online from Thanksgiving to Cyber Monday. To better take advantage of this revenue opportunity, check out these five tips. Offer in-store and online deals. Shoppers won’t come to your store, online or offline, if you don’t offer them special deals on Black Friday. For in-store sales, ensure the product labels reflect the correct price and sales. Customers won’t appreciate being confused about a deal they think is happening if it isn’t. Your online store should also offer discounts on products. However, expand your deals to shipping methods and rates as well. Perhaps if they order by midnight on Black Friday, they can get free two-day shipping (or at least at a reduced rate). Look at previous years’ data. Check what has worked in the past for your business, industry and local businesses for Black Friday. See if they’ve done better by opening Thanksgiving evening or early Friday morning. Some consumers even respect businesses that don’t open on Black Friday. Be sure to also stock up on your yearly best-selling items that never go out of style. When people see a great, limited-time deal, they can become aggressive. You’ve probably heard many stories of people fighting each other over discounted products on Black Friday. You’ll want to update security team and equipment, so you can nip potential brawls in the bud or even avoid potential lawsuits. You’ll also want to ensure your cybersecurity is up-to-date, so hackers can’t access all the extra consumer data you’ll likely receive. On Black Friday, there will be a lot more foot traffic of people looking for the best deal. Prepare your staff for dealing with a high number of people asking questions and long lines. If your deal isn’t amazing to a consumer, they won’t want to wait to buy it. Make sure your staff knows what deals are occurring and for which products. You can also have a quick sheet for them to refer to if you have a lot of products on sale. Lay out your store efficiently. People love deals but hate crowds. Your store should be laid out, so people can find what they need quickly and without constantly bumping into others. Be sure to make the layout of checkout lines clear, so customers don’t get confused and cut others waiting in line. Also, ensure your brick-and-mortar hours are on window display so people know exactly when they can shop at your business. American Express started this holiday in 2010 to celebrate small businesses across the nation. In 2016, Small Business Saturday saw 112 million shoppers and accumulated $15.4 billion in sales. Here are five tips to help you rock Small Business Saturday. Extend your Black Friday deals. Small Business Saturday always falls on the day after Black Friday, so you might be able to ride the coattails of those shoppers by extending your deals through Small Business Saturday. As a small business, you have an advantage over large retailers. While they can extend deals as well, this holiday was made specifically for you. Extend your Black Friday discounts to Small Business Saturday by offering an even larger discount for in-store customers. For example, if you have your boots on sale at 30 percent on Black Friday, offer an extra 5-10 percent discount for purchases made in your brick-and-mortar. For your online store, offer reduced shipping costs for customers who live in or near your zip code (or even your state!). While Small Business Saturday is important for non-local customers, you have a better opportunity to market to your local patrons. Host a breakfast kick-off with other local businesses or partner with other businesses to offer special deals if you show your receipt from the partner. You can also group with local businesses on your block to host an event for Small Business Saturday, so patrons can see which businesses are participating (for example, a festival with booths or a fun run). Offer information to customers to show them how supporting local businesses also supports the local economy. Investing in locally branding products is also a great way to pull in local customers. From totes to posters to shirts to koozies, brand your business and community in a unique way. For example, let’s say your retail store is in a small town like Lake City, Colorado. You can have specially made products that say, “I left my heart in Lake City” or “Lake City vibes” – something that shows pride and love for the customers’ home city. Expand your organic local reach. If you haven’t been focusing on your organic local reach, now is the time to do so. You can do this by setting up optimized local directories. Create directory profiles for popular directories like Google Places, Apple Maps and Yelp. Include high search volume keywords, your physical store’s location and your store’s phone number. In your social posts, include local hashtags. Let’s say you live in Portland, Oregon. You can use hashtags like #portlandshopping, #portlandlife and #portlandor. No matter where you live, make sure you include #shoplocal in your posts. TV, newspaper and radio ads are decreasing year-by-year while digital advertisement continues to grow. As such, you might not think to invest in these areas for your small business. However, you should make an exception for Small Business Saturday by taking out ads in these areas. For example, a radio host could provide listeners with a phrase they can use in the store to get extra discounts, or customers can bring a cut-out of the printed newspaper ad for special deals. Cyber Monday was the biggest day in history of U.S. e-commerce in 2017, seeing $6.59 billion in revenue. Cyber Monday is all about, you guessed it, online shopping and online deals. Since Cyber Monday is all about your online store, here are five ways to get your e-commerce store ready for Cyber Monday. Make sure your site can handle the traffic. While your online store should always be running efficiently, it’s important to ensure it can handle the extra web traffic you’re bound to receive on Cyber Monday. You don’t want customers getting mad that your site is taking too long to load, and you definitely don’t want your site to crash if too many people visit it. If you have various images of each product, limit the number to three or four and optimize them to the right size for faster loading. If you can, try to test the ability of your site by doing a practice run. Double the amount of average traffic you get and see if your site is working as well as it should be. Most e-commerce stores offer free shipping after the customer has purchased a certain amount. However, for Cyber Monday, consider offering free shipping on all orders or lowering your minimum spending threshold. If you offer free shipping after $100, lower it to $50. If you offer it at $50, lower it to $25. You can also offer coupon codes for reduced shipping on all orders. Online shopping was up 16 percent (reaching $453 billion) in 2017, so hook these shoppers in with better shipping fees. Even before Cyber Monday, you should be promoting your online store sales. You could include a countdown at the top of all pages and or add the discount amounts on the sides of the pages. You could also include countdowns for other holidays as well (Black Friday, Small Business Saturday, etc. ), but for Cyber Monday, remember to promote these sales as being online only. Offer customers special deals that they can only get from shopping online. You could even offer codes for extra discounts on your SnapChat or Instagram stories as well to increase your social following and engagement (“for the next hour, use the code CYBER for an extra 10 percent off!”). Mobile commerce, or m-commerce, is steadily growing, especially as social media sites like Instagram allow you to make in-app purchases (2017 saw a 13 percent increase in m-commerce from 2016). If your app looks like a mini-version of your online store, that’s not good because there’s too much design on one small screen. Your app must be designed to make it easier to visit various sections of your store with just the tip of their fingers. It should also make the buying experience much faster. Customers should be able to add items to their bags without losing their spot in the app. If you see a lot of online traffic from across the U.S., offer each coast with different promotions (on top of your all-day discounts). Look at what’s trending on each coast and offer them extra discounts on those items. For example, people in California tend to be on health kicks. Offer the West Coast an extra 5 or 10 percent off water bottles, vitamin powders or yoga mats. You could also offer customers who live in the north with extra discounts on winter wear. December hosts the biggest gift-themed holiday of the year, so consumers will be shopping aplenty throughout the fall and winter. To increase your profitability beyond your projections, check out these seven tips. The holidays are a time for joy and cheer, so your small business brand should reflect that. Make sure your social posts, both organic and paid, evoke positive emotions from users and captions that are meant to spread the holiday cheer. Your brick-and-mortar should be decorated accordingly to make customers feel warm and cozy. You can offer free candy canes, hot chocolate or gingerbread men at your brick-and-mortar to elicit positive reactions as well. Set up different ways to pay. Offering customers various ways to pay will speed up checkout lines and keep your brick-and-mortar less crowded. For both your online and offline stores, offer customers the option to pay with credit card and Apple or Android Pay. Include PayPal for online stores and cash payments for offline stores. Customers will appreciate the various methods of payment and won’t scramble to figure out an alternative method of payment. Offer deals for last-minute shoppers. We’ve all been there (or at least someone who has been there) – trying to find a gift for someone at the very last minute, in a rush to ensure you purchase it on time and in a slight panic over not being able to find the right gift. Last minute shoppers are inevitable, and 76 percent of adults plan to purchase holiday gifts through Christmas. That’s a massive audience for your retail business to reach. A great way to entice them through their speedy mindset is to offer them special deals. For example, let’s say you have a product that hasn’t been selling as well as other products. You can discount these products and market them as last-minute deals. Your marketing efforts should focus on two aspects for the holidays: paid ads and organic reach. If you’ve been hesitant to run paid ads, now is the time to push forward. Create specific ads detailing what deals will be made available and for how long. For paid and organic, figure out what your targeted audience is talking about and wanting to see and create posts accordingly. Social media play a large part in consumer behavior, especially for millennials. In fact, 78 percent of consumers say a business’s social media posts impact their buying decisions. Organic reach and paid ads can both be executed through social media to expand your retail business, both online and offline. However, you should also consider placing ads on search engine results pages as well. Mobile accessibility is becoming more and more important for small businesses. The average American adult spends over four hours a day on their smartphone, and that number is likely to continue to grow. If you don’t have a mobile app, ensure your online store is mobile-friendly (and consider creating an app once things have calmed down). It’s important to update your online and offline stores during the holidays, but you need to remember to update your mobile app as well. You can also offer special deals for customers who make purchases through your app (for example, an extra 5 percent off products). While you shouldn’t assume the worst for the holidays, it’s important to be preventative and take the necessary precautions in case something happens. For your online store, run tests to ensure traffic won’t crash the website and that no one can access your customers’ private information. Have one of your IT employees attempt to hack into your database to see how protected it is. You should also prepare to handle broken products, irate customers, shoplifters and online complaints. Ensure you have enough inventory. If you have certain products you know will be in high demand, make sure you’ve stocked enough of them. Sometimes customers will get upset or angry if a product they wanted is sold out. This doesn’t mean you should stock too much of one item, but try to assess how large of a purchase increase you expect to see and stock up accordingly. Film a fun holiday YouTube video. Video is all the rage when it’s catchy enough. Get your staff members together and create a themed video about your business – holiday focused or not. Share it using your social media channels, and show your customers how fun and personable your business is. Create yearly calendars with your business’s name on them. Better yet, stage a mini photo shoot with your employees at your shop and fill out a whole calendar of high-quality images. This could keep your business top of mind with customers all year round. Offer holiday treats in your store. Shoppers work up big appetites, so help satisfy those empty stomachs with cookies and other bites. If nothing else, hot cider will make your store smell just like the holidays! Host a holiday-themed Twitter chat or Facebook/Instagram live story. These can be focused on either something your business excels in that consumers might want to ask you about or just on holiday trivia to get people in the spirit and interacting with your brand. Have people respond or ask questions on Twitter and in the comments of the Facebook/Instagram live story. Deck your store out with seasonal touches. Play up the fall harvest theme during October and November, and once Thanksgiving rolls around, spin the focus to winter. Play holiday music from the local radio station or a holiday Pandora station. Create a holiday window display with the products you expect to be most popular and will catch the eye of everyone passing by your store. Hold a photo contest on your Facebook or Instagram page. Encourage your fans to send in photos of themselves using your product or at your store or doing something related to the holidays. Be sure to have a giveaway prize for the winner. If you have business clients, take them out for holiday lunches as a personal touch during the season to show them how much their business means to you. Get involved in a food drive or Toys for Tots and prominently display a donation station at your store. It’ll get people in your door that might not have come by otherwise and will show that your brand is community minded. Hire a graphic designer to put a holiday spin on your logo for the season. Shoppers are out longer and later trying to squeeze in every last gift. Do them a favor and stay open later. You won’t regret it. You can build out your website’s homepage to feature a holiday theme. Do the same for social media channels. Include employees, customers, friends and family, and offer your store up for a pre-caroling shopping session beforehand. Email is a great way to put your products and services right in front of customers where they might not otherwise look for themselves, especially at a time when they’re ready and raring to spend. Make the most of partnerships. Partner with other local merchants and help drive traffic to one another’s stores. Organize a group to run the Turkey Trot on Thanksgiving, or get involved in another local, fun sporting event. Set up a gift certificate display. Busy shoppers or those who aren’t sure what to get someone on their list will gladly grab a gift card or two. Offer complimentary shipping and encourage future purchases. Oftentimes, it’s even more valuable than a discount. Hand out coupons valid for the New Year to get customers coming back after the holidays and boost those usually slumping January sales. Take care of the little details. Set up a free gift wrapping station for shoppers who are on the go. This helps simplify things on your customers’ end, so they can make it to that holiday party on time without having to stop at home and wrap. If your store offers products from local vendors, create gift baskets themed with a local touch so members of the community can share some of where they’re from with loved ones out of town. Offer free treats or games for kids. They can get cranky this time of year being dragged around on shopping trips. Help give their parents a break, so they can focus on browsing your store. Hire a developer to create a holiday app for your company to feature all your holiday items or make online shopping easy for them when they’re on the go. Being creative with small business promotion ideas during the holidays has a lot to do with having fun. Enlist the help of family, friends and employees, and start brainstorming even more ways to create the perfect holiday shopping environment for your business. Now that you’ve strategized for your business, it’s time to strategize for your employees. Does your business rely on shift workers for critical staffing coverage? Managing non-desk employees can be a challenge since they’re not sitting in front of a computer with constant access to email or instant messaging. Communicating schedules, schedule changes and general business updates can be difficult without the right tools. Sling’s internal communications features let managers eliminate email and send targeted communications to individual workers, specific groups (e.g. second shift) or the entire company. The app also has a task management feature that allows you to create lists and notify workers of upcoming deadlines. Since all information is centralized, it’s easy to keep track of all communications and changes. The best part is that Sling is completely free. Sometimes the hardest part of managing shift workers is ensuring that they have the support they need to stay engaged and organized. Helping your staff stay organized minimizes coverage gaps and ensures everyone knows when they should be working. ShiftLife Organizer is a calendar app that was designed with shift workers and their unique scheduling needs in mind. Consider when workers take a shift from 7 p.m. – 7 a.m.; the shift crosses days and confuses a regular calendar. ShiftLife Organizer is available for free. Taking the time to let your workers know that these productivity tools are available can help them stay focused when things get busy. Many growing businesses that rely on hourly talent are still manually tracking hours. Employees sign in or out on printed schedules as shifts begin and end. Managers keep a record of who worked and when. Manual time tracking is imprecise. During the holidays, it’s easy to get so busy that critical information is missed. Yet accurate time tracking is important for payroll, taxes, scheduling and more. TimeStation is a free time and attendance app that allows users to keep track of shift workers’ hours. A single mobile device like a smartphone or tablet can be set up as your time and attendance station. Workers receive a pin number or a printed card that they can use to sign in and out in seconds. Reporting features allow managers or business owners to run reports, support multiple locations and use GPS location tagging to verify where sign-ins happened. The holidays are a hectic season for businesses, and the right scheduling tools can help you keep your team on track. Meeting customer needs requires having the right staff ready and available to work. From simple scheduling solutions to productivity tools that remind workers of upcoming shifts, a number of free apps help you control costs and keep everyone organized for the busy season ahead. Any good small business owner shows appreciation toward their employees. The holidays are a perfect time to do so, but it can get costly if you’re not paying attention to prices. To save costs and show your employees how much you value them, here are five cost-effective ideas. Potlucks are great cost-effective appreciation parties, but make sure your employees will enjoy it. If so, keep in mind the few ways you can plan a potluck. You could have employees bring in leftovers from Turkey Day or host an international potluck in which your employees cook and bring in their favorite foreign dishes. You could also provide drinks and entrees and have your employees bring in their favorite desserts. Renting a space to hold a holiday party can be expensive. Instead, host one at your office during office hours. Perhaps on the last half of a Friday or after work during the week. This saves on costs while making it more comfortable for employees. They won’t feel as pressured to attend a formal party, and they’ll be more comfortable being in a familiar space. Offer food and drinks and play holiday games like White Elephant ($20 or less gifts). If you don’t want to host a party, consider organizing a company outing. Maybe there’s a local garden lights show or seasonal home walking tour. You could also look into seasonal discounts for ice rinks or museums. For a more interactive time, consider bowling, roller skating or an escape room. Conduct an office-wide poll, so you can find the most popular option. Outings are great for team bonding, and employees will enjoy doing something they may not normally have time for. If you’re determined to have an offsite holiday party, consider scheduling it after the holidays. More spaces will be available at lower prices, and caterers and bands will be cheaper since they’re low in demand at the start of the year. Post-holiday parties can also help ease the post-vacation blues employees may get after returning to work. Giving them something to look forward to can help their productivity and efficiency. Host nothing – give them a day off. Maybe you don’t have the funds for a holiday event, or maybe it’s not something that fits your business. Instead, give your employees an extra paid day off. If it’s not in the budget to give everyone the same day off, consider giving each employee one additional day of PTO, or a half-day of PTO, that they can take off before the end of the year. Employee appreciation is necessary to keep your team happy, productive and efficient. But that doesn’t mean you have to go over your budget. Hosting events or outings can be beneficial, but you also need to include other bonuses beyond short-term gratification. Sometimes, small business owners would love to give employees bonuses, but they just can’t afford to make it happen. If your profit and loss sheet resembles that remark this year, here are four gift ideas that can express how much you appreciate the year’s hard work without hurting your budget. Not all benefits fall in the category of retirement matching and health insurance. Others, like negotiating a discount at a nearby gym or buying lunch for the office one day a month, cost far less than company-wide bonuses. As a bonus, they remind your staff how much you appreciate them every single time they use the benefit, instead of just once per year. Between samples and employee discounts and just working at the office, your team is already familiar enough with what your company offers, so free merchandise just won’t cut it as a holiday bonus or even as a gift exchange piece. But if you trade some of your gear or goods with a few other businesses in the neighborhood, both businesses can give their people gifts they’ll truly appreciate. It’s best to apply this idea by partnering with multiple businesses, so you can get your staff personalized and appropriate holiday presents – not just a pile of branded t-shirts from a single shop next door. For most companies, a bonus below three digits can feel more like an insult than a holiday gift. But a card for $50 worth of coffee, or books or other little “spoil yourself” items feels significant. Go the extra mile with this option by not buying the same gift cards for every employee. Get the Starbucks card for the office early riser, buy a card at the local smoothie shop for your health nut. Use the nature of each card to illustrate that you care about and appreciate each member of your team. If you’re really on a shoestring, a personal thank you costs you nothing but time and maybe a minute of social awkwardness. Whether it’s written or verbal, public or private, get as personal as you comfortably can to make this holiday moment shine. Call the person by name. Mention specific important contributions made and challenges overcome. Talk about how that person has grown with the company and how the company has grown because of their endeavors. Take time to prepare your notes in advance, doing research if necessary. Done right, this can be more powerful than a check with a surprising number of zeros on it. Done wrong, it feels like making excuses for not delivering that bonus. Regardless of which of these ideas you adopt, or if you instead springboard off this list to a perfect idea that suits your company culture and relationship with your staff, the first rule is be up front and honest. Especially if you have paid bonuses in the past, your employees might be expecting a bonus…or worse, have made plans and commitments that relied on receiving that bonus. No matter how bad you think the news is, share it early and keep everybody updated. Kabbage spoke with small business owners about the holidays. In this post, they discuss how they give back to their communities, what they’re looking most forward to and more! They also provide advice to those who are experiencing the winter holidays for the first time as a small business owner. What are you looking forward to most during the upcoming season? What marketing strategies would you give to small business owners who are new to holiday seasonal shopping? How do you give back to the community during the holiday season? How do you show your employees you’re thankful for them during this time? Take advantage of the abundant sales this holiday season with the right strategy. Start planning ahead now, cross each step off your to-do list and get ready for the peak shopping season!